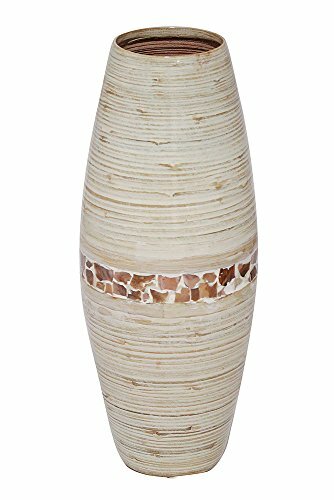 Handcrafted from strips of Bamboo, these vases are spun into beautiful vases all with unique shapes. Great to use with dried or silk flowers (these are not for water use). Light weight for ease of handling, these work well on the floor as well as on a plant stand. Known for it's beauty and durability, Bamboo will hold it color for life (unless in constant direct sunlight). The vases from Heather Ann Creations come in a variety of shapes an colors to best suit your needs. This hand spun rounded shaped vase measures 9.45" in diameter and 23.62" tall. For over twenty years, Heather Ann Creations has specialized in designing a line of unique photo frames, wall decor and tabletop accessories with unusual finishes. Many products are reproductions of 18th and 19th century antique carvings from around the world. The products can be used throughout the home blending age-old tradition with today's contemporary interiors and exteriors.